Over the past few years we’ve kind’ve taken the football party and elevated it to the sort of gastronomical excesses that belie our deeply-held beliefs in a healthy, wholesome diet. The football party is our one concession to gluttony and indulgence and the always-interesting challenge to see just how many platters and bowls of food can fit on every available horizontal surface. As you can imagine, we’ve amassed quite the repertoire of appetizer recipes, and this little bite of heavenly deliciousness is sort of a take on our pasta squares that are almost always a part of our game day food fest. 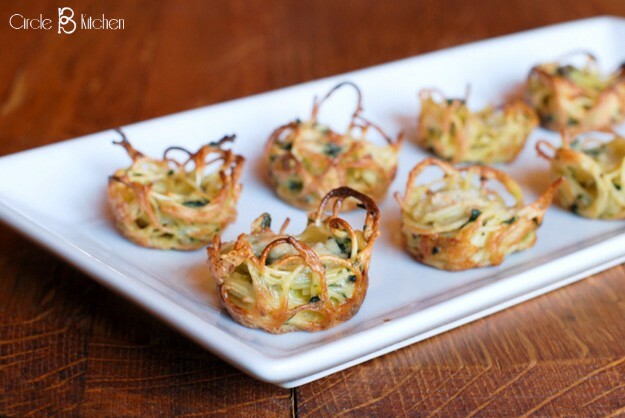 As much as I love those pasta squares, these little pasta bites might edge them out for a spot on the Super Bowl table this year. But, while snacking on these a little while ago, I got to thinking that they would also be ever so cute for a brunch buffet or a wedding or baby shower and would make a great app for a cocktail party. Do people still have cocktail parties? So what exactly are we talking about here? 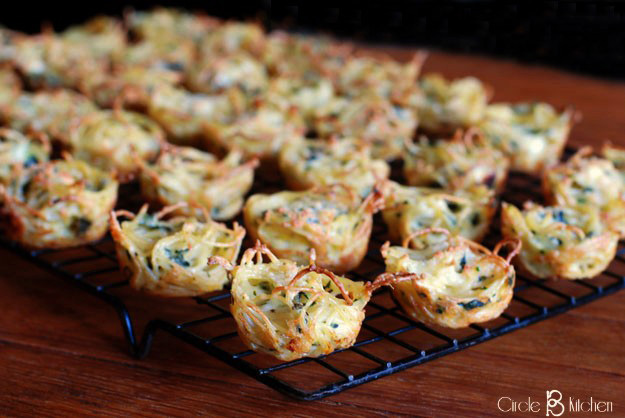 Well, you're just going to be cooking up some angel hair pasta and then mixing that with eggs, cheese and seasonings and then baking them in mini muffin tins until the centers are cheese-y and bubbly and the edges are brown and crispy. They really are a cinch to make and come together in just over 30 minutes, and are best eaten straight from the oven while the edges are still crispy. But re-heating is easy, and they store well in the fridge, so making them ahead is a perfectly fine option. 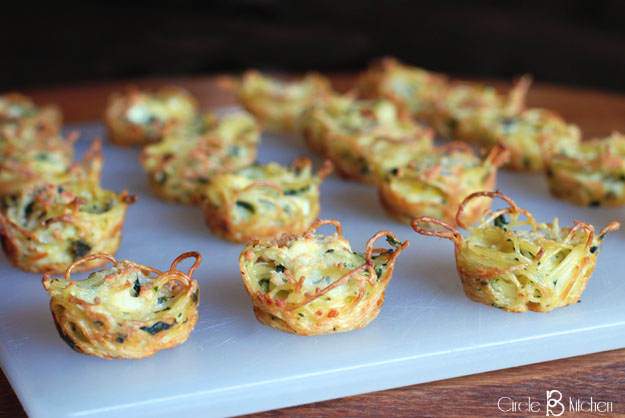 This recipe is basically a template for you to create your own variations of these incredibly delicious little appetizers. The only constant here is that for each 8 oz of pasta you'll use 4 eggs. You can increase the amounts of cheese or sub out the Italian blend for blue cheese or goat cheese or add more spinach or use kale instead. You can make them spicy or not, or you can add your favorite herbs. You could also top them with a little dab of marinara sauce or pesto before serving, but no matter how you make ‘em, they’re best right out of the oven. Preheat oven to 370 degrees. Spray 2 mini muffin pans with nonstick cooking spray. Cook the angel hair pasta in boiling salted water for 2-3 minutes or until al dente. Drain, rinse with cold water and set aside. In a large bowl beat the eggs with a fork and add the remaining ingredients, except for the parmesan for topping. Mix in the cooked pasta and stir to combine thoroughly. 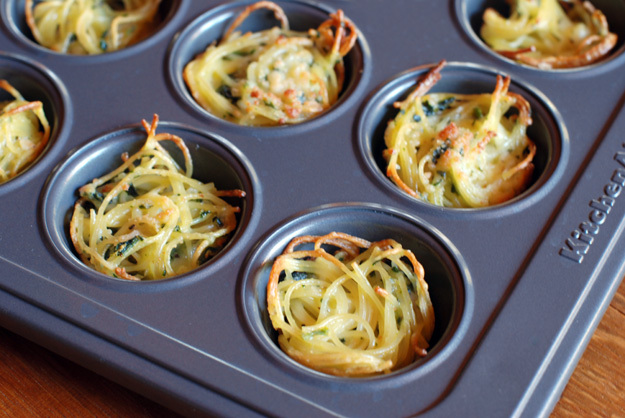 Place a tablespoon or two of the pasta mixture into each muffin cup and sprinkle with a bit of the grated parmesan cheese. Bake for 20-30 minutes or until lightly browned on top. Let cool for 5 minutes in the pan and then remove to a serving platter. Serve them warm with an optional dab of pesto or marinara sauce.